As promised, I made another 3-D card to show you. I learned a little trick with this one which I will share with you in just a bit. I started this card by peeking at this week's inspiration sketch from Freshly Made Sketches. You know I love to start with a sketch because it jump starts my creativity and I can stop staring and start crafting sooner. All of the papers are from the new Fancy Pants St. Nick 6x6 paper pad. Super cute paper pad!!!!! So here is the sketch and I think you should play along too. This week's contest is open until Monday, October 31st. I made the tree using the Christmas Tree die from the new set, In The Meadow Silhouettes from PaperTrey Ink. You get 5 dies in this set for only $14.00. I couldn't believe the price for so many dies! So here's the trick I learned. This tree is not symmetrical, so when you fold it in half, the sides won't match up when you adhere them back to back UNLESS you cut three from the front of the paper and three from the back. Don't ask me how I know this. 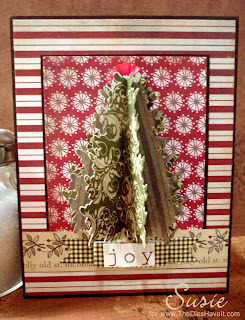 This card is still easy to mail because the tree will fold flat in an envelope and then become 3-D when popped out! Kinda fun I think. I will be back tomorrow with a card about gratitude. And I'll be grateful it's Saturday: Bet you will be too. Oh my, what a fabulous tree Susie ... I love the 3D effect you have achieved with it ... and a great mixture of papers too, love the mixed patterns - they have come together so beautifully! Very cute....in fact, I just tried to buy that die set from PTI and they're sold out! Yikes! I love it! This is really fun! That tree is amazing! Great use of the layout...glad you joined us at Freshly Made Sketches this week! Your tree is gorgeous - what a great effect! Love the banner underneath it as well - beautiful holiday card! What a great way to make a 3D card. That tree is fantastic. 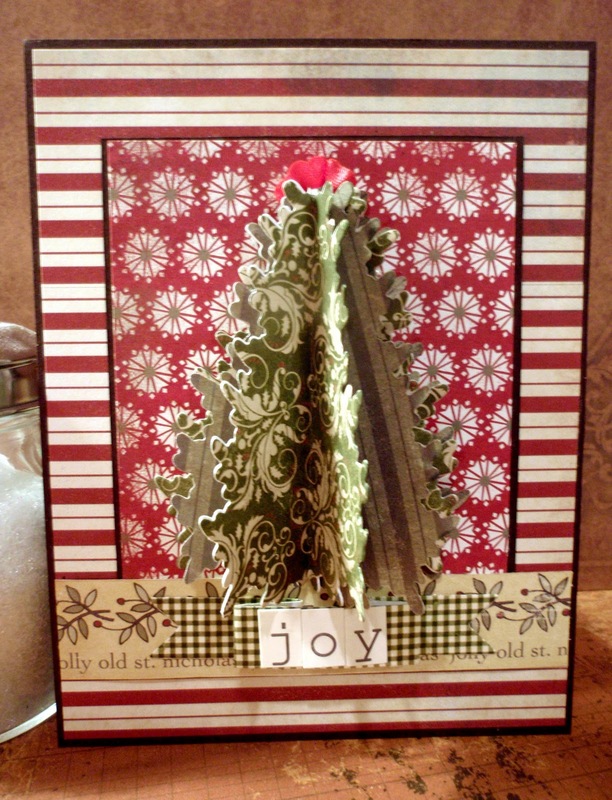 Thanks for sharing the tip about putting the tree together and for joining us at Freshly Made Sketches this week! What a wonderful card and such a great idea. This is so cool Susie...love that it will fold flat! Wonderful colours too! So happy you join us at Freshly Made Sketches. Your card is stunning, the tree is fabulous and I love the DP you used. Susie, wow,wow, and wow! Love this and that 3-D effect is incredible. And it can still fold flat for mailing? Stupendous! Very cool 3-D tree. First I've seen like that! Thanks for joining us at Freshly Made Sketches this week!